Ah, Buford McGee. A great find from the grand old days of the 80’s and 90’s NFL Gridiron. A true team player, McGee was just happy to be there. Buford was one of these guys who was a hard nosed fullback. A rare 5 year college player, he played for the Mississippi Rebels from 1979 to 1983. During his Senior season, he rushed for 580 yards and 7 touchdowns on 141 carries. Buford ran for 1446 yards on 345 carries, and 13 TDs over his career at Mississippi. He also displayed nice touch catching the ball out of the backfield 112 times for 856 yards and 4 more TDs. Buford snuck into the 1984 NFL draft as the 286th player taken in the 11th round, by the San Diego Chargers. Buried on the depth chart behind Earnest Jackson, Lionel James, and Chuck Muncie- McGee displayed the willingness to do what others would not do, and developed a knack for being a powerful blocker. He’d not only make the squad and contribute on special teams, he also ran for 226 yards and 4 TDs. The Chargers continued to get great value for McGee, especially during 1986 when he rushed for a career high 7 touchdowns. With offensive coordinator Ernie Zampese leaving the Chargers for the LA Rams in 1987, Buford was not far behind. He’d be traded to them in exchange for two draft choices and runningback Barry Redden. 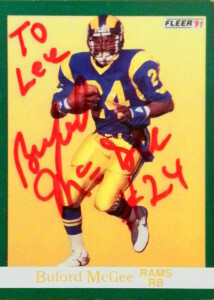 Although injuries caught up with McGee derailing parts of his 85, 86, and 87 seasons, he continued to contribute to the Rams offense in whatever capacity he could. In 1990 he had a career high 234 yards on 44 carries, and caught 47 balls for 388 yards. 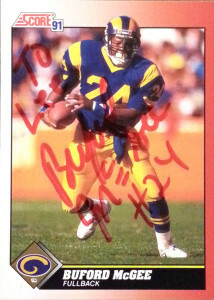 The LA Rams named Buford their 1990 MVP. After the 1991 season, head coach John Robinson was relieved of his duties, and going for a more ground oriented approach, new head coach Chuck Knox cut Buford in May of 1992. McGee made one final stop in Green Bay. He’d suit up for the Packers for that last season where he started 3 games. Retired, he now lives in East Texas. I was really happy to get the former Ram on these cards. Buford was never really appreciated for his contributions to the pro game by the fan at large, but coaches far and wide appreciate what he did for all those teams he so unselfishly played for. 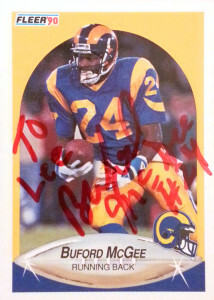 McGee is also a member of the 1991 Los Angeles Rams Tecmo Super Bowl team.